Skin toners can include harsh alcohols which strip the skin of its' natural oils. Instead, we'd recommend flower waters (known as hydrolats) as a natural alternative. We have now upgraded our flower waters, so they are organic and sourced from a Soil Association accredited company. They are produced during the distillation of essential oils (so they all smell gorgeous), and contain water soluble plant extracts which are so soothing to the skin. After cleansing simply dampen a cotton pad and sweep over the skin, morning and night, to leave it feeling soft and refreshed. These are safe for use around the eyes, and do not contain any preservatives or chemical additives. 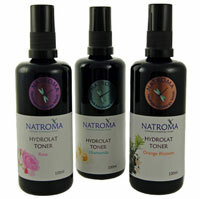 Our new flower waters are now part of the Natroma skincare range - visit our new Natroma skincare website They are specially packaged in violet glass bottles (with a fine mist spray attachment) to ensure they are better protected from light, to retain their natural potency. Hydrolats or flower waters, are produced during the steam distillation of essential oils. These aromatherapy waters contain water soluble plant extracts making them perfect as natural skin toners. Our organic chamomile hydrolat has hardly any aroma, and is very gentle and skin calming making it suitable for sensitive skin types. Re-use your Miron glass bottle again, by purchasing this refill bottle! It's better for the planet, and we'll reward your recycling with a cheaper price too. Hydrolats or flower waters, are produced during the steam distillation of essential oils. These aromatherapy waters contain water soluble plant extracts making them perfect as natural skin toners. Our organic orange blossom hydrolat is slightly astringent, making it suitable for normal, combination and dry skin types. Hydrolats or flower waters, are produced during the steam distillation of essential oils. These aromatherapy waters contain water soluble plant extracts making them perfect as natural skin toners. Our organic rose hydrolat has a lovely delicate sweet aroma, and is gentle and skin calming making it suitable for all skin types.